Toshiba’s Digital Products Division (DPD), a division of Toshiba America Information Systems, Inc., announced the availability of a new Toshiba 3.5-inch External HDD, marking Toshiba’s first entry into the 3.5-inch external HDD business. The product offers digital consumers and business professionals a stylish and affordable back up device with dual connectivity, robust software features and up to 1TB of capacity from a trusted brand. 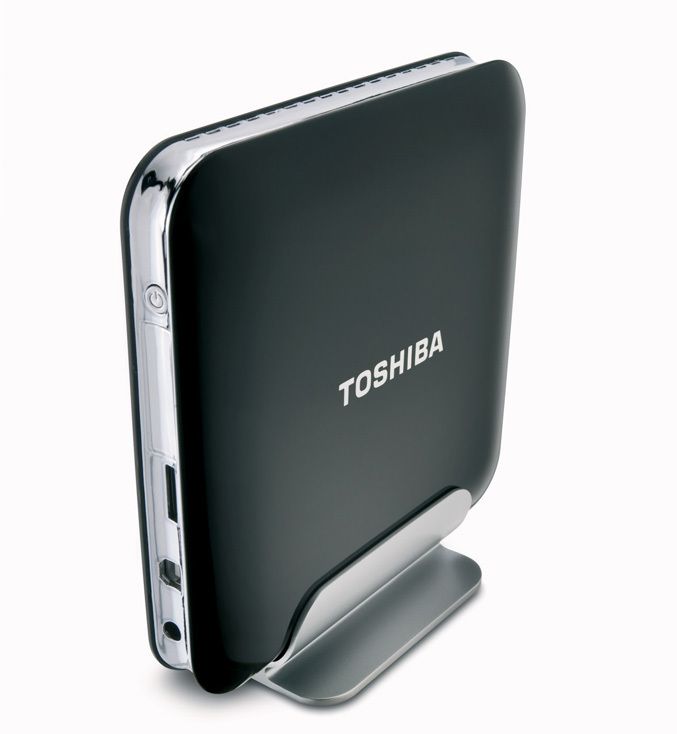 The Toshiba 3.5-inch External HDD features dual connectivity with high-speed USB 2.0 and eSATA ports, as well as a robust software application that offers reliable and easy data protection. In addition, the software package allows consumers to not only back up and restore selected files, but also their entire system. With its sleek glossy finish, Toshiba designed the 3.5-inch External HDD to match its family of consumer laptops, while the slim form factor design and space-saving footprint conserves desk space. The hard drive is priced competitively at $129.99 MSRP1 for 640GB2 and $159.99 MSRP1 for 1TB2. All versions of the hard drive are PC and Mac compatible and are backed by a Toshiba 3-year standard limited warranty. AVAILABILITY: Available now through select Toshiba Preferred Partner Program resellers, retailers, e-tailers and toshibadirect.com.